When I wake up in the middle of the night on the weekend, I don't ask "Why the hell am I awake at this hour?" I just enjoy it, the world is so quiet then. And it means I can justify a good long nap later that day. It happens a lot when I have a big event that morning, out of fear of oversleeping. Sometimes it just happens and I read for a couple hours before falling asleep again. These breads are the fruits of yesterday's 2:30 am awake time. 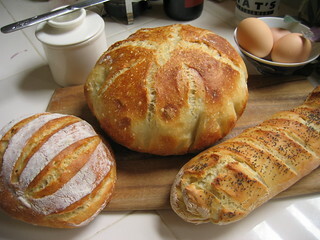 Inspired by E, I checked out Artisan Bread in Five Minutes a Day and made the basic master dough for the boule and baguette. I already had a batch of NKB dough brewing, so I baked that so we could compare the breads. Oh yeah, once you get used to working with the wet dough, it really is as easy and less time-intensive as described. There's just a bit of waiting for the dough to rest and bake. If you plan ahead, you can have awesome fresh bread every day.